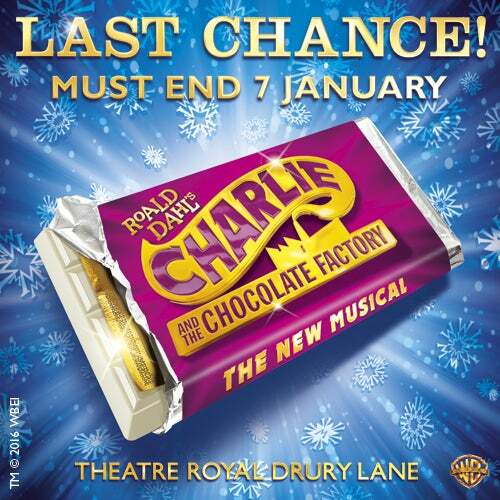 Roald Dahl's famous story of Charlie And The Chocolate Factory finally makes the transition from screen to stage at the Theatre Royal Drury Lane in London. The tale about Charlie Bucket, a young boy who finds a much sought after golden ticket enabling him to enter into the mysterious chocolate factory owned by the legendary and reclusive Willy Wonka. The colourful stage sets do the story justice by lighting up the stage in a blaze of colour and wierd and wonderful design delighting the audience as the show follows true to the plot of the classic Hollywood movie with young Charlie realising and living his dreams by exploring the delights of the Wonka Chocolate Factory along with his Grandpa Joe. Seats in the rear stalls priced at £25 face value and classed as 'restricted view' have a slim pillar in the sightline. You will have a clear view by leaning slightly to the left or right. Strobe Lighting and Gunshots are used in this production.